This is a very rare Fada 140A from 1922. Probably close to being the very first Fada radio. I know of only one other surviving example. This hasn't seen restoration. I thought it was fine the way I bought it. This probably doesn't qualify as a battery set since there aren't any batteries involved with the tuner but it is still fairly rare. This is my 1920 Clapp-Eastham Z.R.F. Regenerative Receiver with a homemade cabinet. 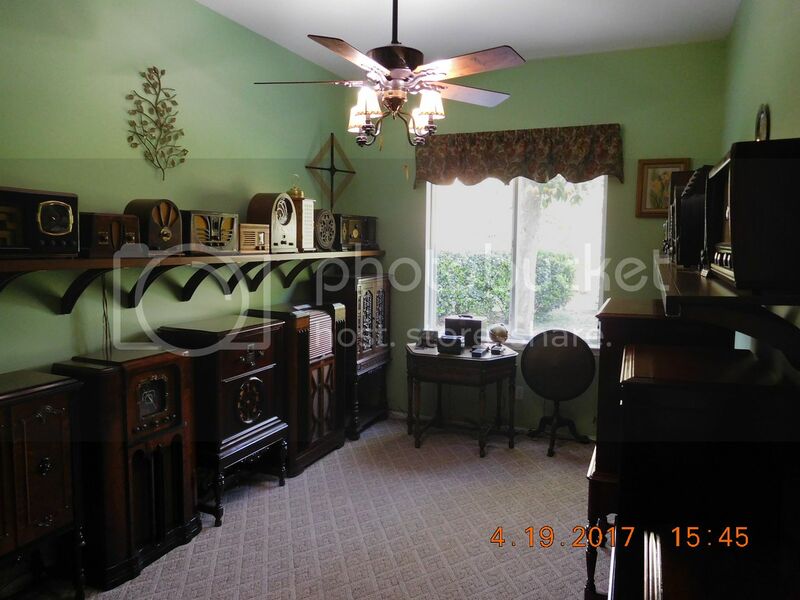 These sets were actually not sold with with cabinets. I would say this set qualifies as being somewhat rare. I only know of a handful still surviving. Thanks for posting the picture of the Rutland Vermont Senators. I had seen that picture in the past and always wondered what was the receiver! I missed it completely but our radios are quite different. Here is mine on top and yours is below. Yes indeed, the market was changing rapidly and small'ish business were most certainly building in small batches that they could tweak or change drastically without heavy investment in tooling or changes to the manufacturing floor. My PC hardware AND heavily used software are now 10 years old, I'm terrified at having to upgrade everything probably very soon... Not just for the hardware upgrade but facing the fact that really useful boxed software has been replaced by 'vampire - never ending subscriptions' For folks like me on SSI, that is VERY bad. Alan, Here are the undersides of my Betts and Betts pair, unrestored of course. The amp is on the top.The topsides are identical to yours but I am wondering what your serial numbers are and if the same person was the final inspector. The Betts and Betts horn appears to be identical to a Metal Products Company horn. Thanks for posting these pieces. There might have been a more elaborate set that came along later. Thanks Merrill, Here are the pictures from my sets. Apparently these sets were in production a lot longer than you would think since my tuner has a 1-28-1924 date which I would assume was the inspection date and the D/A has 11-28-23 on it. It appears that all four pieces were inspected by the same person. Interesting stuff. With a serial number range as large as is shown it is surprising more of these sets haven't surfaced. I don't know who built this, but I wish they had because they deserve to have put their name on it. I've never seen another like it. Elements of the construction suggest home-brew, or perhaps a set assembled from a kit (anyone have any clues? ), but there was a lot of thought put into the layout and the construction quality is first-rate. Both the primary and secondary windings on both Hegehog transformers are good. 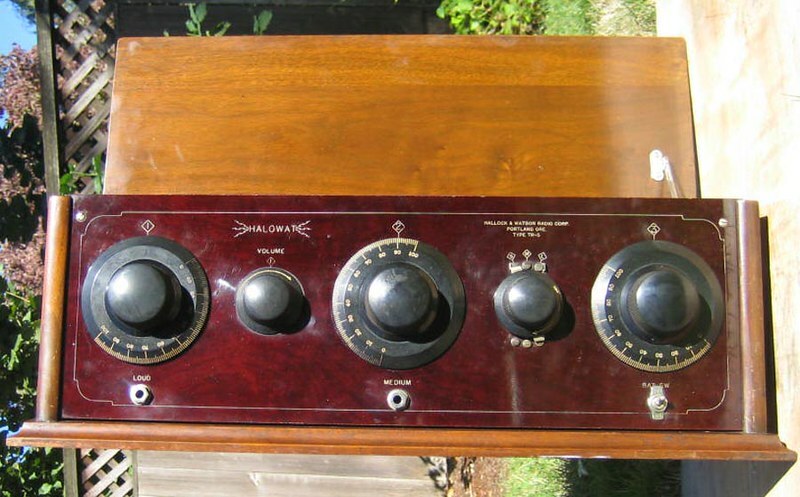 Hard not to love a well made early radio with Hegehog (aka hedgehog) transformers. 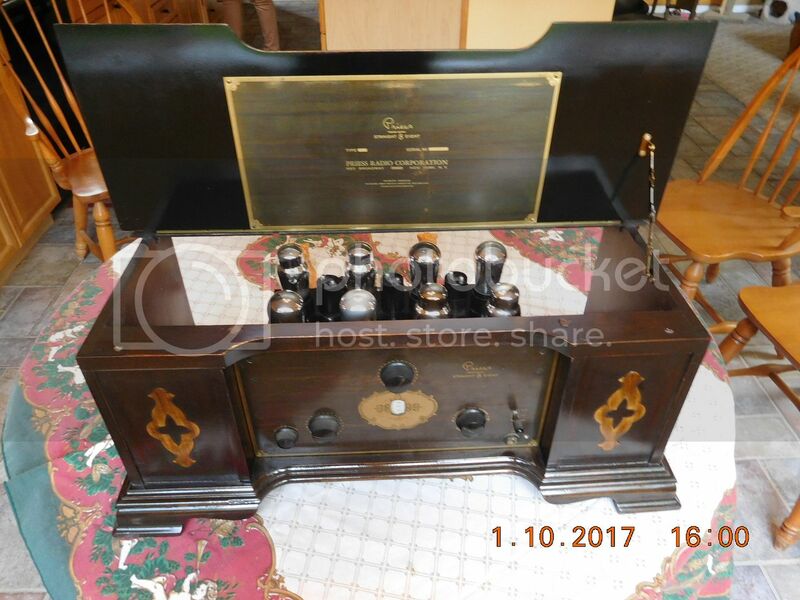 This is the elaborate and hard to find Tuska 227 regenerative radio which appeared for a short time in 1923. I only know of two of these that survived. The ads said "it was the first to get across" meaning amateur contact with Europe. The more common 225 soon superseded it. I wanted this to complete my Tuska collection so I was willing to pay what I had to.. This group was manufactured under the name RECO (Radio Electric Company) of Fremont, Ohio. An identical pair was sold at John Terrey's auction a while ago. This group came from Rochester a few years ago. I'm trying to find the owner of Terreys sets so we can compare them. Probably 1922 or early 1923. I was hoping to see more activity here. I know you guys have some good stuff. Okay Merrill I'll see if I can add a few sets to keep this thread going and I love your Tecla pair. Dayton Phone Receiving set from 1922, a three tube set with lift-off lid. Still looking for the 'TUNER' metal tag under the left dial. Here's an early one tube set made by Northland Radio Company here in Minneapolis, found here many years ago in an antique shop! It's the only one like it that I've seen. It was built using a RAY-DE-O Case and it works. This is a seldom seen A. C. Dayton R-12 from 1923 or 4. This was a predecessor to the XL series by that company. Production was evidently limited . I have seen only one or two ads for it and only one other set. I'll post an ad here when I find it. First, if you did not see my other thread, Photobucket now has a $99 annual plan for those only putting photos on forums and such, but not selling on EBay and such.